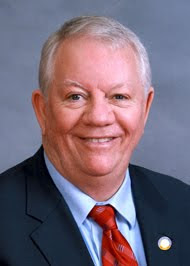 NC House member Bill Owens of Elizabeth City, one of the Five Goobers from Demsville that the Republicans are counting on to override Gov. Perdue's veto of their budget, has already announced that he's probably not going to run for a 10th term in the NC House, which means in all likelihood that he's turning a deaf ear to his own political base. It's an open debate whether Rep. Bill Owens really thinks he's doing the right thing, strapping on that feedbag with the Republicans, or whether he's just very bedazzled with his own power as a horse-trader. Shameless hussies, all of them. Thanks for keeping up with it. I just hope voters remember them in November, 2012. He's a person who thinks compromise means giving the other side exactly what it wants. Oh, and an idiot.